Before Sam learned to walk, she learned to dance. My husband says she inherited his happy feet, but I do think the Kindermusik classes as well as the constant music in the apartment also contributed to her love for movement. She has a good sense of rhythm too! Sam would initially dance to anything and try to copy the steps she’d see on TV. 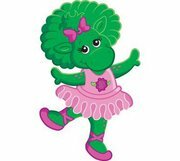 Then she zoned in to ballet when she saw Baby Bop dancing it on a Barney episode. Ever since then, she’d been asking me if she could “do ballet” and would proceed to twirl around and tiptoe all over the house. We’re all about encouraging and supporting whatever activities Sam is interested in, so I began to scout around for toddler ballet classes. A lot of the ballet schools I called said that they would only take her after she turned three and that their cut-off date for entry was August. That meant that with her birthday in November, she wouldn’t be able to dance ballet until the following year. I don’t think I could take another year of “I want to do ballet mommeeeeee!”, so I kept asking around. Thank you, Triangle Youth Ballet! Thankfully the Triangle Youth Ballet school made an exception for us. They said that for as long as she was potty-trained and that she had no problem separating from me, then she could start ballet this fall, two months before she turned three. It worked out well since the location was the nearest to us too! Sam was all too happy and excited to start her classes; she literally could not wait. She made no complaints about buying and fitting into her white tights, pink leotards and ballet shoes. In fact, the day that we bought her uniform, she asked to put it on and refused to take it off until bedtime. For her first session, our entire family went to support her, cameras in tow. There was someone at the entrance of the classroom that stopped the parents from walking in with their children because they wanted the girls to “cross the threshold” on their own. Sam had no qualms about it; she let go of my hand and went straight towards the teacher. She didn’t even look back to say goodbye. It made me think about what a big girl she was already. For the entire session, she did everything Ms. Hannah the teacher, taught her to do with a smile on her face that at the end of the class when they let the parents in for the final “number”, Ms Hannah approached me to say that Sam did splendidly. She was confident, she was happy and she absolutely loved it. Then… disaster. To Sam’s surprise, the last five minutes of the class was saved for each little girl to dance to their parents. This was followed by a bow to the audience before they were allowed to leave. I watched Sam go through the motions of it all, but her face morph from pure ballerina ecstasy to that of embarrassment and self-consciousness. When she was finally allowed to come to me, the poor thing was fighting so hard to hold back the tears. She eventually broke down and when I got her to talk, she said she didn’t want the parents to come in and that she was shy. Even if the applause were not directed towards her, she still felt embarrassed by it and kept her wet face buried into my shirt. I’ve always known that Sam would shy away from adults and the limelight, but I didn’t realize how much it upset her until that day. The week after we went back and Sam refused to step into the classroom and do the dance numbers with her friends. The last 5 minutes were burnt into her memory and she just didn’t want to do it anymore. That made me sad, because prior to that little traumatizing experience she actually loved the idea of ballet and did it so well the first time around. So I spoke to the teachers and they allowed her to “skip” the ending if she wasn’t comfortable with it. I don’t want to force her to do it too, because I’m afraid that if I push her into it when she clearly isn’t ready, then she’ll carry that feeling with her as she grows up. So each time we get ready for her class, she gamely steps into her tights and leotards but at the same time tells me that she doesn’t want the parents to come in. “I only want to dance with Ms Hannah and my friends mom,” and she says this to her teacher too. So for as long as she exits the classroom before the parents come in, ballet once again becomes a fun thing to do. While a little bizarre, I find it an interesting aspect to her personality. Normally children her age are happy to show off and get the attention from adults. That is typical of Filipino gatherings too, when children are asked to “show off” for the adults. We’ve hardly asked Sam to do that though, which has turned out to be a good thing since she most likely wouldn’t do it. The one thing I learned from Sam’s Kindermusik teacher Rebecca, was that these things — public speaking, performing in front of an audience — take time to build up in kids like Sam. What’s important she says, is that you always present them with the opportunity and accept their decision as to whether they choose to take it or not. In her class for instance, Rebecca gives the children time to approach a fake microphone one by one and be put at the center of the room. She also asks that the adults refrain from clapping or reacting because it could intimidate the kids. What she wants is to create is a safe environment for the kids to be themselves and eventually over time, the shy children will learn to trust the environment and try it out when they are ready. Rebecca says it’s important that they are not forced or pressured into conforming because it helps them develop their own confidence levels at their own pace. I am glad I learned this little piece of information early on so that I don’t put my girls in a spot that will scar their self-esteem for life! In the meantime, we will treat her ballet as just that; an opportunity which she will hopefully decide she wants to take later on. I show her that I am happy she has a good time for the first 40 minutes, and that she can step out to watch the other girls dance for their parents for the last five, although I am also secretly hoping that she will soon want to do a little tippy-toe dance number for me. For now, I will settle for the sneak peeks I can get from behind closed doors. I was going to say video please and there it is! Super cute 🙂 As long as she is enjoying and having fun! Malay mo she’d be ready to face the crowd come recital day 🙂 Keep us posted on Sam’s ballet adventures! Haha thanks! Yes I know. She steps out of class but is smiling now and willing to clap for her friends once in a while. Hopefully soon!